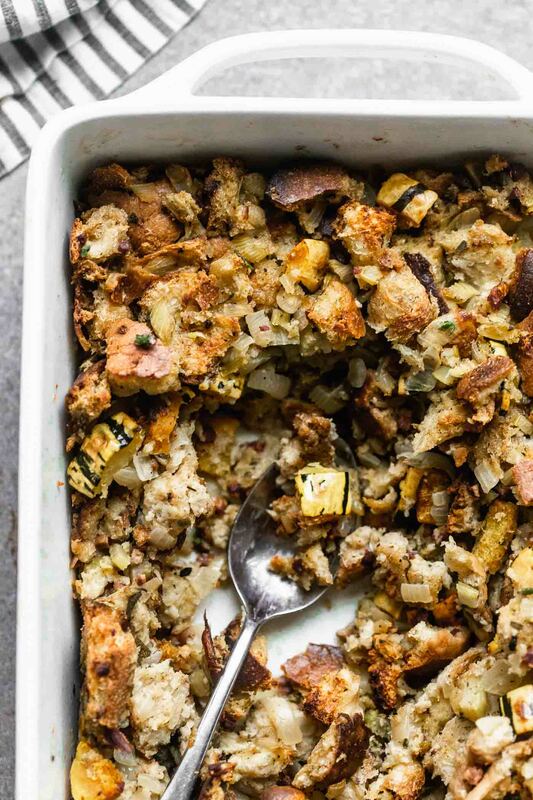 Delicata Squash, Sage and Pancetta Stuffing is a classic stuffing, updated. It has all the flavor of the original with the addition of sweet squash, salty pancetta and nutty brown butter. A crowd pleaser for sure! I remember it vividly. Four weeks ago, I took my kids to the pool on a hot-as-heck post-summer day, and wondered if it would be the last day we’d get to splash in the water without dreading the brisk air after we got out. It was. How did we get from swimsuits and ice cream cones to Halloween and Thanksgiving prep in the span of a mere month? Granted, most of you probably aren’t knee-deep in Thanksgiving recipe testing, but that’s what I’m here for. To give you a little nudge in the right direction and remind you that even though it may seem like Thanksgiving is light years away, it’s really just around the corner. 38 days to be exact. Is your mind blown? Mine was. Every year I strive to come up with new, inventive side dishes to grace our holiday table, but I almost always end up coming back to the basics. Simple roast turkey with gravy. 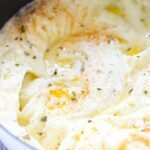 Classic mashed potatoes (that are SO creamy). From-scratch, but still nostalgic green bean casserole. The area where I always seem to take the most liberties is with the stuffing. Every year, I try to stick with tradition, but end up throwing a few uncommon ingredients in the mix. 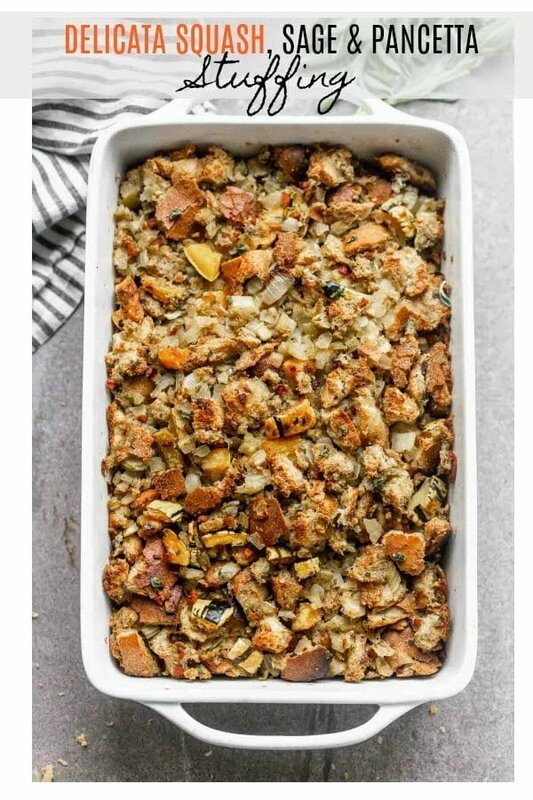 And every year, I deem it my new favorite way to eat stuffing. This year is no exception. 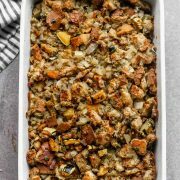 While Delicata Squash, Sage and Pancetta Stuffing at first glance, screams unconventional, after you dig in, it still mimics the same flavor profile as a classic stuffing. There’s tons of onion, celery and sage as the base flavor profile, but add-ins like sweet squash and salty pancetta give a subtle upgrade in flavor. I had every intention of the pancetta being a more dominant player in the ingredient lineup, but just like the brown butter, it becomes almost undetectable amongst the sage, onion and celery – in a good way. 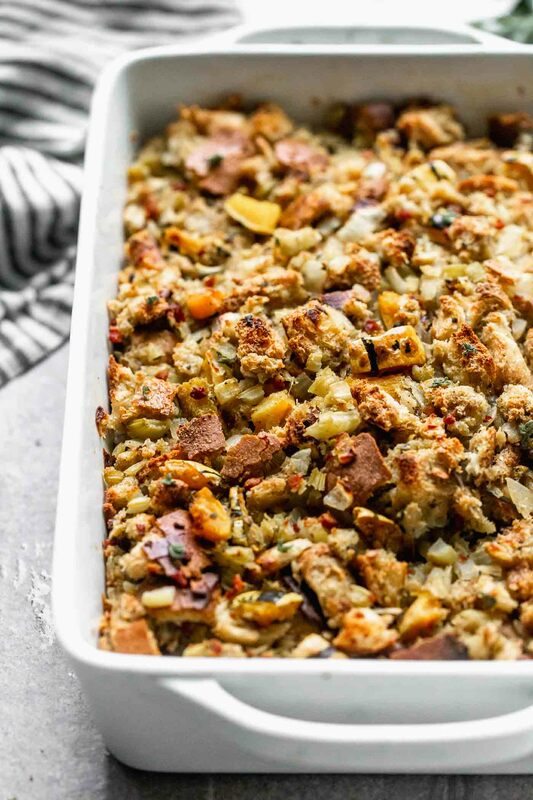 Instead of staying crispy to the bite after baking, it takes on a softer texture that lines up with classic stuffing. Brown butter gives off an underlying hint of nuttiness, that even the most discerning palate probably couldn’t pinpoint, but leaves you wondering why on earth this stuffing tastes so much better than the rest. 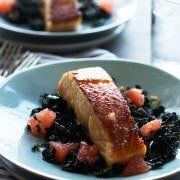 I’ve yet to find a dish that doesn’t benefit from a little bit of brown butter, but if it seems like an unnecessary added step, you’re free to skip it, it won’t sabotage the entire dish. 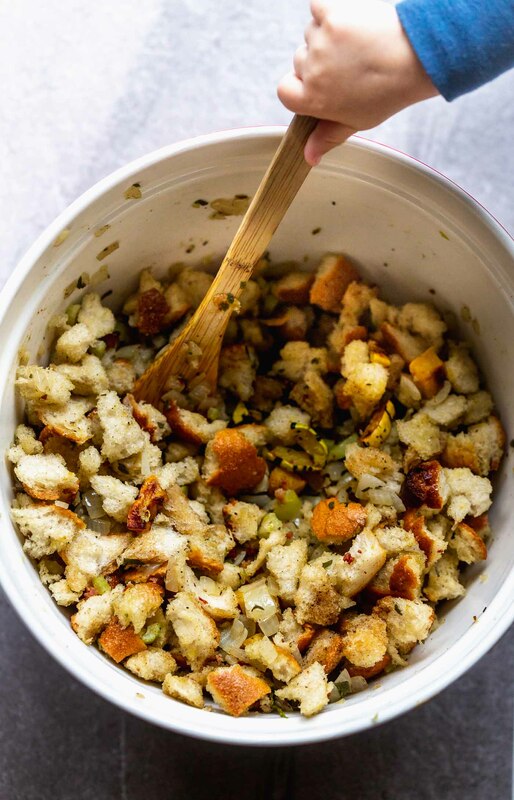 I’m sure you don’t need to be reminded, but the key to a good stuffing is all in the bread. 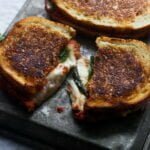 I like to use a good-quality, sturdy and crusty Italian loaf, but ciabatta, or even a nice white sandwich bread will work. And here’s the key: dry your bread out! Leaving the bread out for 24 whole hours is where you want to be at. It dries the bread just enough, but it’s not rock-hard. 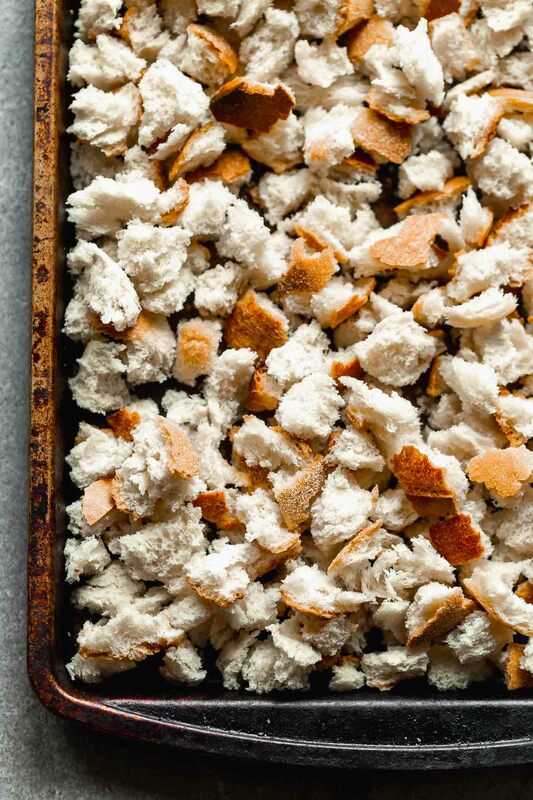 A lot of recipes will say you can dry the bread out in the oven, but I’ve always found the texture turns out better when you do it the old-fashioned way. All it takes is a little bit of thought ahead of time. So if you’re reading this 38 days before Thanksgiving, make a little mental note – you can’t go out and buy your groceries the day of. Once all the ingredients are added to a big mixing bowl, it’s essential you don’t over mix. I think while a lot of stuffings resemble mush, and that’s ok, it’s important to have little bit of texture in the end product. 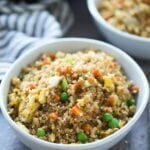 A great tip I got from this recipe, was to whisk the eggs with some of the chicken stock so the eggs are evenly distributed throughout the stuffing. So smart. After a final seasoning check (seasoning is also key to a good stuffing! ), the mixture is transferred to a baking dish, covered with foil and baked for 40-45 minutes. After the initial baking process, the foil is taken off and it bakes for another 30-35 minutes until the top is golden brown and puffed. Things you should do the day before. Tear and dry the bread out. Cut the onion, celery and sage – store in a ziplock baggie. Figure out what baking dish you’re going to use. I wouldn’t recommend assembling the entire dish before, as it might get soggy. Feel free to sub out the delicata squash with butternut or acorn. Pancetta can be subbed with bacon, just be sure to chop finely. Ciabatta or good-quality white bread also work. I typically buy pancetta at the deli counter, but for this, I recommend buying the pre-packaged diced variety. I got mine at Trader Joe’s. It’s hard to get pancetta chopped as finely as they can. Don’t forget to let the bread sit out for 24 hours. You can eat the skin of the squash – it has great texture! 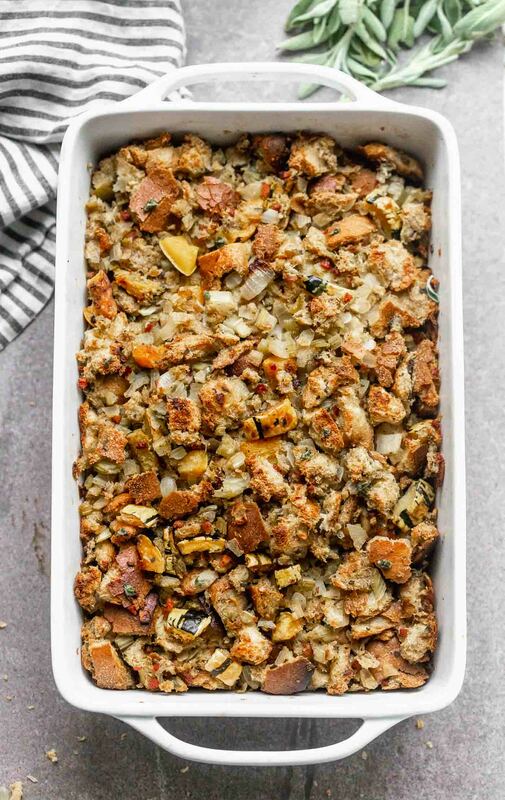 Simple Sage and Leek Stuffing : A classic! 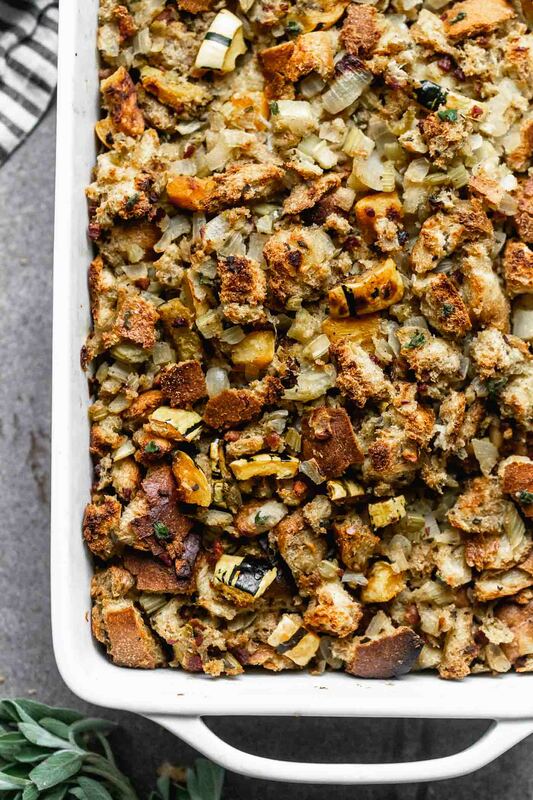 This is a no-frills, perfect stuffing. Cornbread Stuffing with Italian Sausage and Dried Cranberries (Please excuse the terrible photos!) 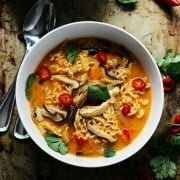 : Sweet, savory and SO good. Cornbread Dressing-Stuffed Acorn Squash : A great way to portion control or serve individual servings! Delicata Squash, Sage and Pancetta Stuffing is a classic stuffing, updated. 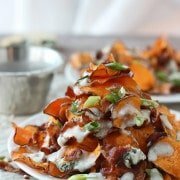 It has the flavor of the original with the addition of sweet squash, salty pancetta and nutty brown butter. A crowd pleaser for sure! 13 cups crusty Italian bread, torn into 1/4-inch to 1/2-inch pieces SEE NOTE!!!! The day before: Tear bread into 1/4-inch and 1/2-inch pieces. Lay out on a baking sheet and let dry out for 24 hours. Preheat oven to 375 degrees. Toss chopped squash with olive oil and 1/2 teaspoon salt. Roast until golden brown and slightly soft. You don't want them too soft, because they will cook again in the stuffing. Reduce heat to 350 degrees. Grease a 9x12 baking dish. Add dried bread to a very large bowl., Cook pancetta until crisp in a large skillet. Pour the pancetta along with any accumulated fat over the bread. Wipe the pan clean. Add 4 tablespoons butter to the same skillet. Once it's melted, add the onion, celery, sage and 1/2 teaspoon salt. Sweat until slightly softened, about 3-4 minutes. Again, they don't need to be mush, as they will continue to cook in the oven. In the last 30 seconds of cooking, add the poultry seasoning. Pour mixture over bread. Wipe the pan clean. Add remaining 6 tablespoons butter to the same skillet. Turn the heat on medium-high. Let the butter melt and once it begins to turn brown, swirl the pan. Continue to swirl the pan until the butter becomes a deep brown color and smells nutty. Turn the heat off and pour the butter over the vegetables and bread. Add 1/4 cup of the chicken stock to the pan, and use a wooden spoon to get all the brown bits up. Pour over bread and vegetables. Add 1 1/2 cups chicken stock to a liquid measuring cup. Add eggs. Whisk until eggs are completely combined. Pour over bread and veggies. Add remaining 1 teaspoon salt, 1/2 cup chicken stock and roasted squash. Toss GENTLY until combined. Season to taste with salt, pepper and poultry seasoning. Pour stuffing into prepared baking dish. Cover with foil and bake for 45 minutes. Uncover and bake another 35-40 minutes or until the stuffing is golden brown on top. 2 Responses to "Delicata Squash, Sage and Pancetta Stuffing"
Can you stuff your bird with this stuffing? I haven’t tried, but I imagine you would be able to, yes!